In the latest round, the Cuban team beat defeated Mexico 4-1. World Series of Boxing (WSD) Season IV winners, Cuba Domadores, have started this year’s tournament with a perfect start with five consecutive victories. This week, Cuba beat 4-1 the Mexico Guerreros at the latest match held at Olympic Gymnasium Aguascalientes, north of Mexico City. Cuba’s first win against the Mexican team was due to a technicality as Daniel Paniagua was not allowed to fight against Erislandy Savon since he was shown to be overweight for the heavyweight division. However, flyweight Joselito Velasquez defeated Johanys Argilagos (49 kilograms) by 48-47, 49-45 and 48-46, in the first fight giving a point to Mexico. In the 56 kg fight, Mexican Brian González was defeated by Cuba’s debute player, Andy Cruz. In the 64 kg division, the Cuban AIBA World Championships silver medalist and Olympic bronze medalist Yasnier Toledo scored 3-0 against Mexican Raul Curiel. Cuban Arlen López also won against Mexican Misael Rodriguez, 3-0, in the 75 kg division. 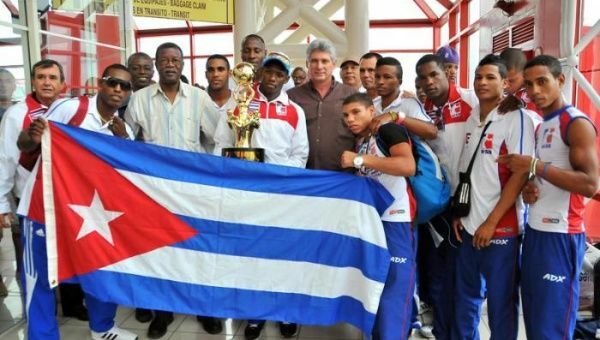 Cuba has maintained its top position for the last five weeks, reaching 15 points and 24 victories. Next Friday, Cuba’s Domadores will place at the Ciudad Deportiva de La Habana against the British team Lionheard.